February may only have 28 days, but Savers took advantage of every single one this year. 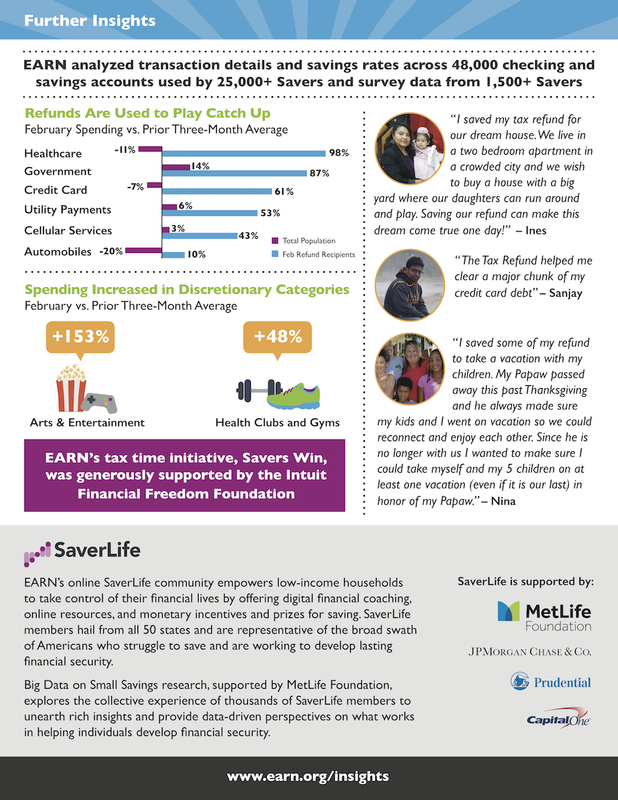 Sixty-three percent of refunds received by Savers were received in February, and the subsequent flurry of banking activity provides clues into what Savers did with that money. 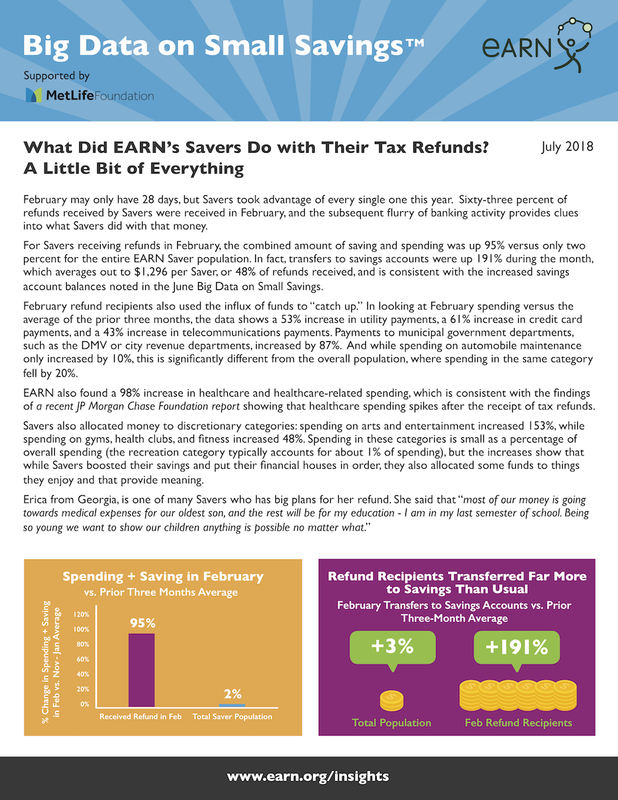 Of Savers receiving tax refunds in February, EARN observed a 95% increase in debits that month versus the prior three-month average. This compares to a 2% increase for the entire EARN Saver population. Not all of that money was spent, however, because internal transfers from checking to savings accounts were up 191% ($1,296 per Saver, or about 48% of refunds received). This is consistent with the increase in savings balances noted in the June Big Data Brief. February refund recipients also used the influx of funds to “catch up.” In looking at February spending versus the average of the prior three months, the data shows a 53% increase in utility payments, a 61% increase in credit card payments, and a 43% increase in telecommunications payments. Payments to municipal government departments, such as the DMV or city revenue departments, increased by 87%. And while spending on automobile maintenance only increased by 10%, this is significantly different from the overall population, where spending in the same category fell by 20%. EARN also found a 98% increase in healthcare and healthcare-related spending, which is consistent with the findings of a recent JP Morgan Chase Foundation report showing that healthcare spending spikes after the receipt of tax refunds. Savers also allocated money to discretionary categories: spending on arts and entertainment increased 153%, while spending on gyms, health, and fitness increased 48%. Spending in these categories is small as a percentage of overall spending (the recreation category typically accounts for about 1% of spending), but the increases show that while Savers boosted their savings and put their financial houses in order, they also allocated some funds to things they enjoy and that provide meaning.